John Dingell: House agrees on cash-for-guzzler bill. 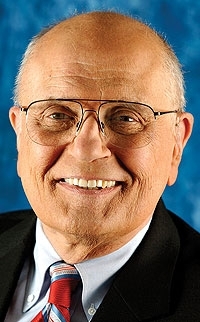 WASHINGTON -- Democratic lawmakers have proposed a cash-for-guzzlers bill that would provide vouchers of up to $4,500 to people who trade in cars and trucks for new, more fuel-efficient vehicles, Rep. John Dingell said. The program, if approved by Congress and signed by President Barack Obama, would lead to about 1 million new-vehicle purchases, the Michigan Democrat said in a statement. Customers would get a $3,500 voucher if they trade in a car that gets less than 18 mpg for a new car with mileage of at least 22 mpg. Vouchers of $4,500 would be awarded if the new car gets at least 10 mpg more than the old, the statement said. The mpg standard is the EPA's combined city-highway average as listed on a vehicle's sticker. For same-class trade-ins for trucks and vans, the trade-in vehicle must have been manufactured in 2001 or before. But age restrictions will not apply to other vouchers for cars, according to an e-mail from Dingell's office. And in what appears to be a major compromise among the various automotive constituencies, the current measure offers no special incentives to buy American-made or American-owned brand vehicles. The U.S. auto industry hopes such a program here can mirror its success in several countries, particularly Germany. So far this year U.S. vehicle sales have plunged 37.4 percent. But Germany, which passed a similar measure in February, posted gains of 19 percent in April and 40 percent in March. General Motors, in a statement released today, said it supported the measure. "Scrappage programs implemented in other countries around the world have proven to be very successful in re-invigorating car and truck sales," the statement said. "The approach of providing vouchers for new vehicle purchases, which is tied to getting older, less efficient vehicles off the road at the same time is a huge win for consumers, the economy and the environment." UAW President Ron Gettelfinger also endorsed the measure. "Congress should act right away on this high-priority measure, to deliver an immediate stimulus to our auto industry and to keep Americans working, Gettelfinger said in a statement. This program will spur consumer demand for new vehicles, thereby injecting much-needed cash into our ailing domestic automakers, Dingell said. It also would result in meaningful reductions in energy use by American drivers, he said. Vouchers would also be offered for swaps of small trucks and SUVs, large light-duty trucks and work trucks, the statement said. The program would be authorized for up to a year. The agreement was brokered by Dingell and five other Democrats, including Rep. Ed Markey of Massachusetts and Rep. Henry Waxman of California, chairman of the House Energy and Commerce Committee. A Dingell spokesman did not immediately respond to a question of when and in what form the legislation would be introduced.